Here’s how it works: Students draw a line down the middle of their paper. One one side they write “give one” and the other side says “get one.” The teacher asks a question or makes a statement, and students respond by writing their answers/reflections in the “give one” column. Then students are put into groups where, one by one, each students shares what he or she wrote in that column. Whenever a student hears an idea/question/response that he or she didn’t have in the “give one” column he/she adds it to the “get one” column. The purpose is to share ideas or questions about a specific topic so students hear various voices and opinions while also sharing their own. It’s pretty self-explanatory and a good reminder to ask higher-order thinking questions in addition to the lower-level. I was introduced to the NSRF Harmony protocols by one of my education professors, and some of the activities are very useful. The idea is that using these activities will get 100% participation out of your students. Not all of the activities are very good, so I’ll take a few weeks to summarize the good ones. Most if not all of the activities could be used in English and social studies classes. Affinity Mapping: Students are given 5-10 sticky notes which they (silently) write notes on and then stick to the board or large piece of paper that has a question or phrase on it. As they stick the notes to the board/paper, they do so in categories (or not). This prompts individual thinking, writing, organizing, and discussion/reflection. It’s like Chalk Talk except the sticky notes can stay on the paper or poster without needing to be erased. Block Party: Write quotes (or facts) on index cards. Allow students to reflect/write about the card they were randomly given. Students then walk around and find quotes or facts that fit together, compare and contrast, etc. I’ve seen a brilliant activity where students got a few index cards. On a card was a picture (from a magazine) of a person/alien/animal, another card had a setting or time, and another card or two had a situation written on it (“late for a party” for example). Students then had to start writing at story using those elements. Then students had to pretend that their character just met the character of the person sitting next to them and then write about what happens next. 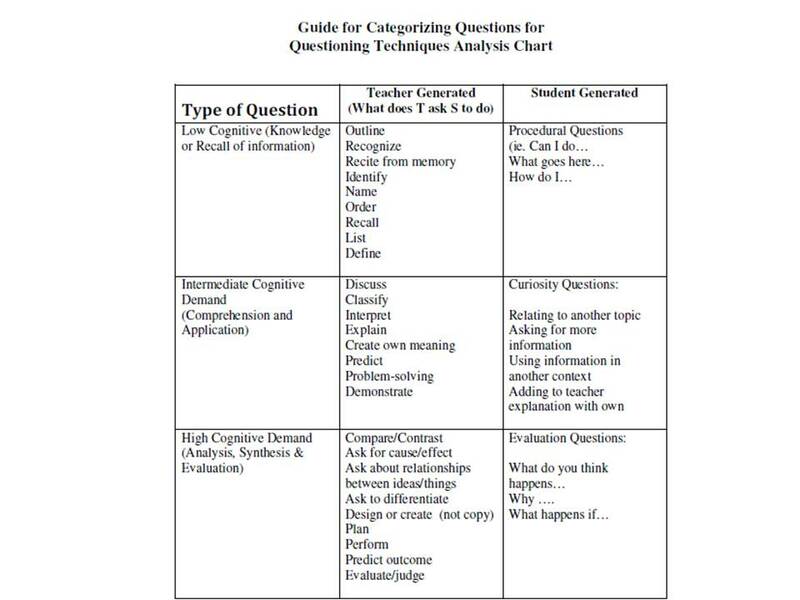 Blooming Questions: not an activity, but a good resource for Bloom’s Taxonomy. Chalk Talk: Down and dirty form of Affinity Mapping. Teacher writes a word, phrase, or question on the board (or more than one question on more than one board). Random students get pieces of chalk or dry-erase markers and silently write a response on the board. Then they give the chalk/marker to someone else. Students can indicate whether or not they’ve gotten a chance to write anything by putting their thumb up so that each student gets a chance to participate. Check-in Circle: Ask each student to say one good and one bad thing happening in their life. I’ve also seen this activity used where students only say one good thing to get everybody focused on the positive. It’s a good cheering up and checking in activity. Not all students necessarily have to participate all at once – just pick a few students to volunteer, but keep track so that the same students aren’t sharing every single time. Examining Student Work: Students examine their own work to determine what qualities make it exceptional or not. After they have made individual observations, the whole class compares notes and then attempts to give those positive attributes to the assignment that the teacher then gives or to an assignment that they can revise. This exercise can also lead to the formation of a project rubric. Feedback Principles: A guide to giving and receiving feedback. The giving part is more relevant, I think, and could serve as a good resource for teachers to put into student-language before giving to students. The Final Word: Students work in small groups and take turns speaking about a specific passage or quote. When one person is done, the other members contribute their thoughts on that quote. Then the next person speaks to their quote, and on and on. Every person gets a chance to share and analyze, and each round is carefully timed. Forming Ground Rules: Students write down a list of rules they wish to have in a group discussion setting, such as “everybody get a chance to speak,” “respect,” “no interrupting.” Go around in a circle and have each student share one item off their list, no repeats. Continue until everybody has shared all they have written. This could be a good set-up for students who are new at discussing in large or small groups. Every student contributes and everybody is listened to. The “rules” can be listed on the board or typed and printed for each student to have. Four “A”s Text Protocol: Students write down or verbally share assumptions the author of a text has, what the students agree and argue with, and what they aspire to after having read the text. I’m not sure about the “aspire” part, but I like the first three “A”s of looking critically at a text. Ice Breakers and Warm-ups: Not a big fan of ice breakers, but some of these activities could be used as warm-up writing or public speaking prompts. Individual Monthly Action Plan: Walks users through a goal they have, how they’ll accomplish it, what help they’ll need, and how they’ll know if they’ve accomplished it. Jigsaw: Students divide (by assigning them a number) into groups and discuss or read something. Then students get new numbers so that new groups are formed with one representative from each group. Then each student takes a turn teaching the others what they learned or discussed in their previous group. Difficult to explain but works very well. Making Meaning Protocol: Teacher/facilitator asks what students see after reading a text. Discussion. Teacher asks what questions arise by reading the text. Discussion. Teacher asks what the significance/importance of the text is. Discussion. Gets at the various layers of analyzing a text with lots of scaffolding. Making Meaning Protocol: Storytelling Version: In small groups, a student reads a short story (or poem or anything else written) and students take turns giving feedback. Then the original storyteller responds at the end about how his/her ideas have changed/improved because of this activity. Pair Communication: Person 1 talks about/reads something. Person 2 doesn’t speak until person 1 is done. Then person 2 summarizes what person 1 said. Roles switch. Could be a good exercise in both listening and summarizing. The Paseo or Circles of Identity: Students fill out a graphic organizer and make a list of what defines them/their identities. Then students get into two circles (one inside the other) and everyone pairs up and answers questions/shares. Both components or each separately could be used for a variety of activities. The GO could be used to organize ideas from a story, stereotypes, one’s identity, etc. Ideas can be shared through the two-circle idea while using ideas from the GO or separate from that activity. Ping Pong Protocol: Does not include ping pong, sadly. Teacher poses a question or prompt. Students independently write, then they share, then ask probing questions, then write a synthesis, and then have a final conversation. It could be easily altered to be shorter and to fit different age groups. Pocket Guide to Probing Questions: Reminds me of the levels of questioning from another post. This protocol gives examples of what a good probing question does and looks like. Questions and Assumptions: Students sit in groups and have a question or prompt, different for each group. Students brainstorm questions about the prompt or responses. Then every group shifts one table/desk to the left or right leaving one member from each group where they are. That remaining person will teach the new group what was talked about before. Then the groups discuss assumptions about the question/prompt. It’s like the jigsaw activity but a little less complicated. Something other than responses/questions and assumptions can be the focus of group work as well. Quotes for Closing: Not a protocol, but a bunch of great quotes. I have this vision of inspirational quotes from men and women of varying ethnicities all around my classroom. Save the Last Word for Me: In groups of 4, one student gets a set amount of time to explain why he/she selected a certain passage or what he/she thought about something. Each student then gets 1 minute each to respond. Then another person gets a chance to explain and get responses from everyone else. Scrambled Sentences: In small groups, students are given envelopes with individual words that they must form into 5 complete sentences. They cannot speak and may trade words with other groups. Student Staffing Protocol: Giving feedback to one student at a time in which the good and bad are discussed. Then, as a group, students work to help the student in question improve. Could work well in small groups. Text Rendering Experience: In small groups, each person shares once per round. Groups begin by discussing a word, then sentence, then phrase that they connected with in a text. Could be modified to include paragraphs or just one round to focus on a single sentence. Tea Party: Quotes are written on index cards. Each student randomly selects a quote and independently reflects. Then students mingle and share quotes. More extensive activities can be followed afterwords. This protocol is supposed to be used as a pre-reading activity. Here are some ideas for getting students to respond as individuals, pairs, groups, or as a whole class so as to assess their knowledge and learning. Asking students to raise their hands and calling on the first or so hand up or listening to the first blurt-out leaves behind the quieter and less confident students as well as those who need some time to think and process. Write responses on individual white boards or pieces of paper as individuals or pairs that students can hold up and show to the teacher. For example, students have a certain amount of time to write an answer. When you ring a bell or say “go,” all students raise their boards or papers so it’s not a race to finish first. Students write answers/ideas in notebooks and then some volunteers share after everyone has had time to think and write something. Or call on specific individuals without asking for volunteers.